Two goals from the impressive Connor Tomlinson saw Luton Town round off their pre-season campaign by beating Southern League opposition Bedford Town this evening. The teenage second year scholar, who is the Hatters' youngest ever player, gave further glimpses of his predatory instincts with two composed finishes in either half that were the difference on the night. As expected, the Hatters went with a young side, including new youth team recruit Lewis Swindells, but there were run-outs for Lloyd Jones, Aaron Jarvis, Jack Senior and Frankie Musonda, while Bedford had ex-Hatter and Conference winner Paul Benson leading the line. They looked good from start to finish too, as Josh Neufville in particular caught the eye, particularly before the break, while Toby Byron gave a solid performances at the back, with Swindells doing well at the base of the diamond as well. Neufville had a good chance on six minutes, picking up keeper Kyle Forster's poor clearance but having worked the shooting space, fired well over. Jarvis then went close as latching on to a ball over the top, he headed past the stranded stopper, only to see Forster recover and make a crucial sliding challenge behind for a corner. Musonda went close from the set-piece, as did Drew Richardson once Jarvis had sent Senior away on the left, the midfielder's attempt blocked by a home defender. Luton had a deserved lead on 22 minutes, Senior escaping the offside flag to fire the ball across goal for Tomlinson, who slotted into the gaping net. Hatters should have had a second moments later, Tomlinson doing brilliantly to wriggle clear in the box before picking out Jarvis who could only shoot straight at Forster. Former Luton attacker Dan Walker went it alone from 25 yards for Bedford, failing to test Harry Isted, but at the other end, Richardson did make Forster work, his rasping drive stopped at the second attempt. Arthur Read's bouncing shot was easy for Forster, before he was replaced by Niall Cooper, the sub making a smart stop from Richardson's 20-yarder. Tomlinson had his second of the evening with 15 minutes to go, producing an instinctive half volley when Musonda headed down Read's deep corner to seal victory. Eagles: Kyle Forster (Niall Cooper 61), Brett Longden, Jordan Jarrold, Matty Harriot, Mason Watkins-Clarke, Ollie Swaine, Craig Daniels, Callum Donnelly (Bradley Woods-Garness 61), Paul Benson (Taylor Rhiney 73), Dan Walker (Lee Roache 61), Phil Draycott (Connor Furlong 18). Subs: Cade Abbey, Ashton Grant, Dean Dummett. 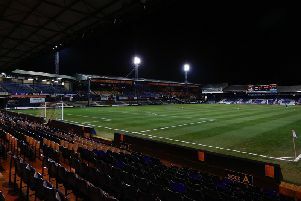 Hatters: Harry Isted, Frankie Musonda ©, Jack Senior, Lewis Swindells, Lloyd Jones, Toby Byron, Drew Richardson, Arthur Read, Connor Tomlinson (Avan Jones 85), Aaron Jarvis, Josh Neufville (Josh Boorn 78). Subs: Ricco Grecco, Jonas Kalonda, Corey Panter, Tiernan Parker, James Holden.